Enjoy flexible and laidback touring with the Club’s own Overseas Site Night Vouchers. Better still, purchase these vouchers and you'll gain access to the Club’s unbeatable Eurotunnel and package ferry rates. We guarantee to be the same or lower than booking with the operators direct. If you do receive a cheaper fare from an operator, we’ll match or beat it. Overseas Site Night Vouchers give you freedom and flexibility to tour around the continent, safe in the knowledge there’s no need to pre-book your sites. Just turn up to the site and hand over your vouchers for your stay*. One voucher in the low season and two vouchers in the high season equal a one night stay on the Caravan and Motorhome Club’s inspected and selected overseas campsites. What’s more, when you use these vouchers on your holiday, you have the peace of mind that the Club is there to support and help you every step of the way. 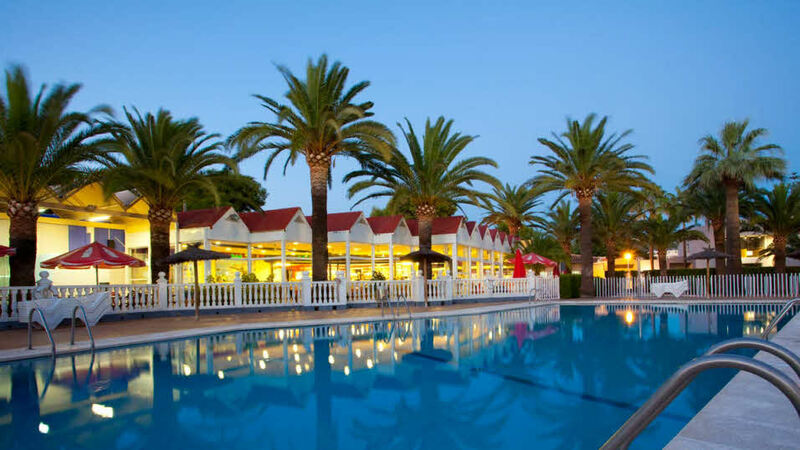 Vouchers cost just £21.95 each and by purchasing the vouchers through the Club, you’re paying for your holiday in advance and at a fixed exchange rate. That way you won’t need to carry lots of extra currency when you’re abroad! *When using the vouchers in high season, we do recommend giving the campsite a call to double check they have space for you. Buy Overseas Site Night Vouchers and your ferry crossing together to save money. The voucher currently on sale is valid for two calendar years, running from 1 January until 31 December. For example, 2018/2019 vouchers will be valid from 1 January 2018 until 31 December 2019. In high season, two vouchers are required for a one-night stay. High season includes Easter Holidays (typically from the Sunday of the week leading up to and until the following Sunday of the week after Easter weekend) and all of July and August, but this may vary from campsite to campsite. Pitches on campsites are subject to availability. This voucher does not include the cost of any extras which can include but are not limited to local taxes, pitch upgrades, pets, additional adults and children. A minimum of four cheques apply when you purchase online. 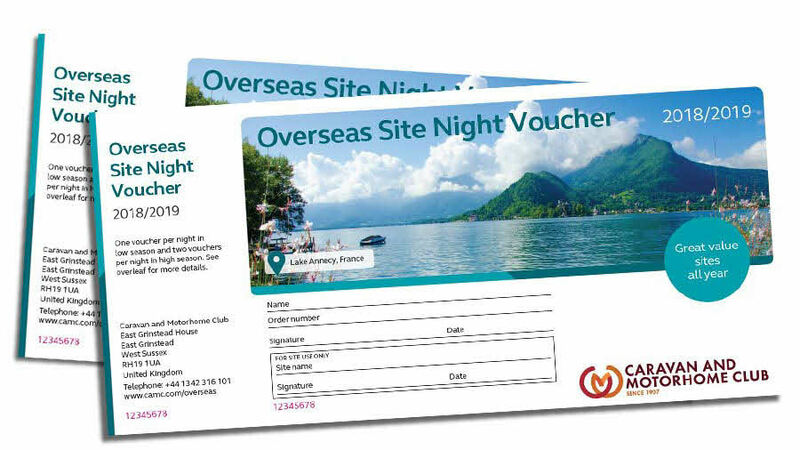 For details of the campsites that accept these vouchers please visit the overseas holidays page or request a copy of our overseas campsites and ferries brochure Venture Abroad. In case of any problems, please contact the Caravan and Motorhome Club on +44 1342 316 101 or email europeanholidays@camc.com. This voucher must be presented at the time of arrival to the campsite, signed and dated by the lead member and signed and dated by the campsite. This voucher cannot be redeemed alongside a voucher of any other type or in conjunction with any other special or discounted offer. Once redeemed on site, vouchers cannot be refunded or replaced even if nights are not used. No cash alternative will be offered by us in place of, or in exchange for, a voucher. Vouchers are not for resale either privately or through auction sites. Vouchers can only be redeemed by the person to whom they were issued and cannot be gifted or transferred to another person. Lost, damaged, expired or stolen vouchers are not exchangeable, refundable or replaceable. The name of the member printed on this voucher must match that of the membership card and must be presented on arrival at the site. The vouchers are bound by our terms and conditions, which can be found here: https://www.caravanclub.co.uk/booking-terms-and-conditions/. Please familiarise yourself with these. This voucher is operated by The Caravan Club Limited. *Facilities of a standard pitch will vary from campsite to campsite. This voucher will only be valid on the campsite’s most basic pitch, which may be a simple electric hook-up or could be a comfort pitch with water, electricity and drainage. It is at the campsite’s discretion which pitch is allocated.